It's a Tiger! 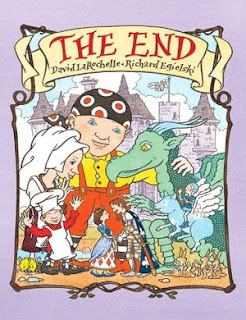 is the new book from the fantastic David LaRochelle. 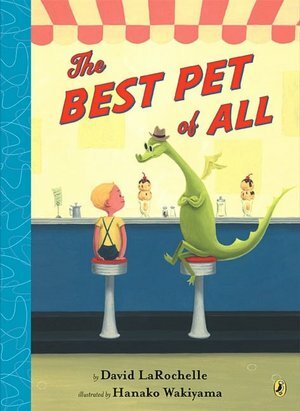 I am remiss that this is my first full review of one of his books, but I did feature two of his books in my Best Picture Books of 2008 post. Happily, It's a Tiger! is a fantastic book and an instant story time staple for me at the bookstore and also great place to begin to introduce you to the books of David LaRochelle. Jeremy Tankard's illustrations are perfectly matched to LaRochelle's story and will have little listeners following closely. It's a Tiger! begins, "Are you ready for a story? Me too. We'll start in the jungle where the tall trees grow and the monkeys swing from vine to vine. Wait a minute. That's not a monkey. That looks like..."
"A TIGER! Run!" Bulging eyes (for the monkeys and the main characters), a vivid red background and the need for speed burst from the two page spread. A quick visit back to the first page of the story reveals a stripy tail amongst the monkeys and vines that sharp eyes will have noticed. Even if they don't, by the next spread they will figure out what's going on. Tankard's illustrations are bright, simple and a little bit primitive, which adds to the excitement. La Rochelle's narrative has a "Going on a Bear Hunt" feel to it, which keeps listeners on the edge of their seats, but the text is smoother and doesn't have the sing-songy promise of a rhyme that never comes like "Bear Hunt" does. This formula is repeated over and over as the main character (I'm pretty sure it's a boy, but I think you could convince listeners it's a girl if you really wanted to, which I do sometimes) continues to try to run away from the tiger. Through a cave, a snake pit, a bed of flowers and onto a boat. Finally, a treasure chest on a desert island is not filled with jewels and gold but a roaring tiger. Or is the tiger roaring? Maybe he was only yawning. Maybe he needs a story to help him sleep. Like all the best books, It's a Tiger! circles around to where it began while also shaking things up. 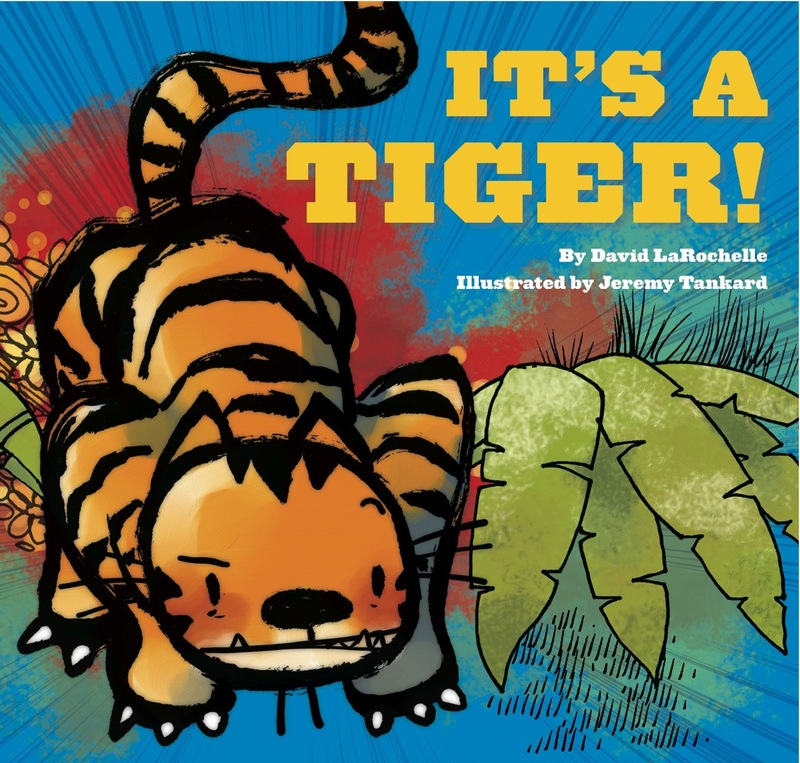 In an effort to lull the tiger to sleep, the narrator says, "We'll start in the jungle where the tall trees grow and the monkeys swing from vine to vine. Wait a minute. That's not a monkey. That looks like..."
It's a Tiger! 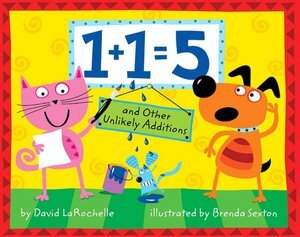 is a deceptively simple book, the kind that kids want to hear over and over again and adults never get tired or reading.